As she often does, my daughter turned me on to a new food I had never tried or heard of before. This time it was riced cauliflower. When she first told me about it I thought it was some kind of rice that had been processed out of dried cauliflower. So, when I asked one of the folks at Trader Joe’s if they had it riced cauliflower they said no based on my description. My daughter said it could be hard to find so I was not really surprised when Trader Joe’s looked but could not find it among the rice and pasta nor in the freezer section. Of course, when I told D about my trip to Trader Joe’s she put me on the right path and let me know that riced cauliflower isn’t really rice. Instead, the fresh cauliflower is “riced” and cut down to resemble rice. On my next trip to Trader Joe’s I found riced cauliflower in the fresh vegetable section. 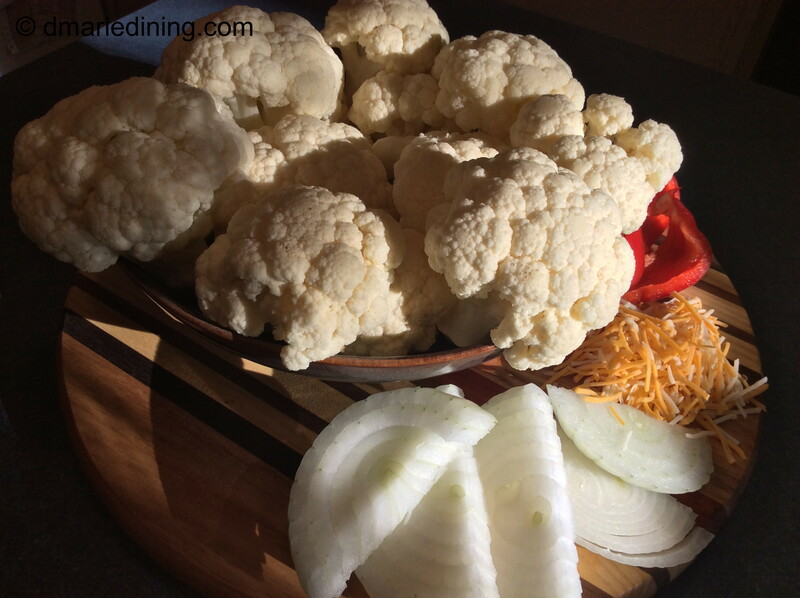 Cauliflower is plentiful in the warmer months and is great in salads and soups. 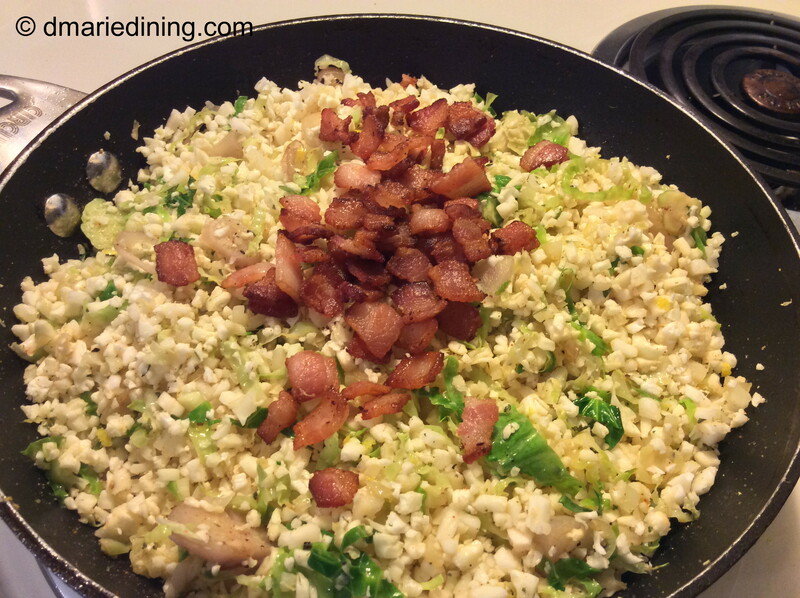 I decided to create a different kind of recipe for my cauliflower by pairing it with brussel sprouts. Hence, my Riced Cauliflower and Brussel Sprouts recipe. If I do say so myself the dish was pretty tasty on the first try. One thing to remember when preparing cauliflower is to not overcook it. I learned the hard way just how mushy cauliflower can get if you cook it too long. 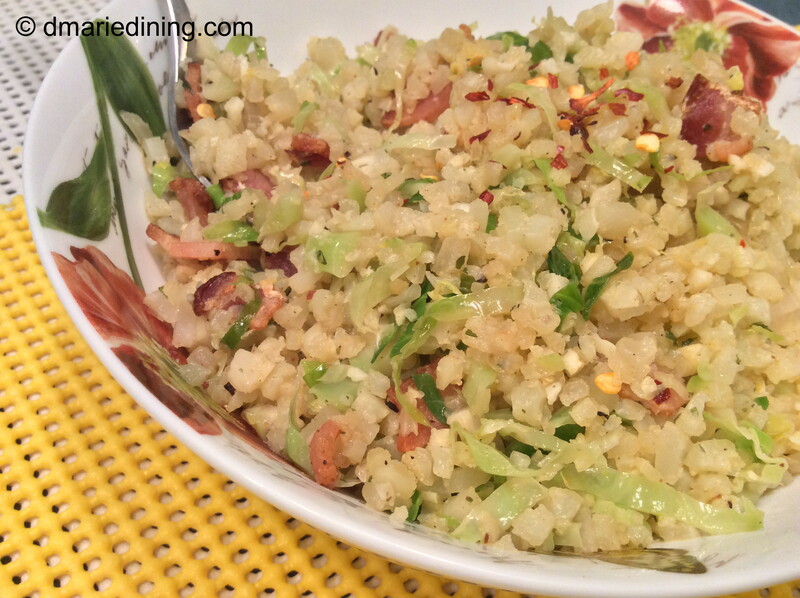 Riced cauliflower cooks even quicker than cauliflower florets so this is definitely a quick and easy recipe to make. For my vegetarian friends this recipe is wonderful as both a side dish or a main course (just leave out the bacon). I had a nice sized bowl of Riced Cauliflower and Brussel Sprouts for lunch which was quite filling all by itself. 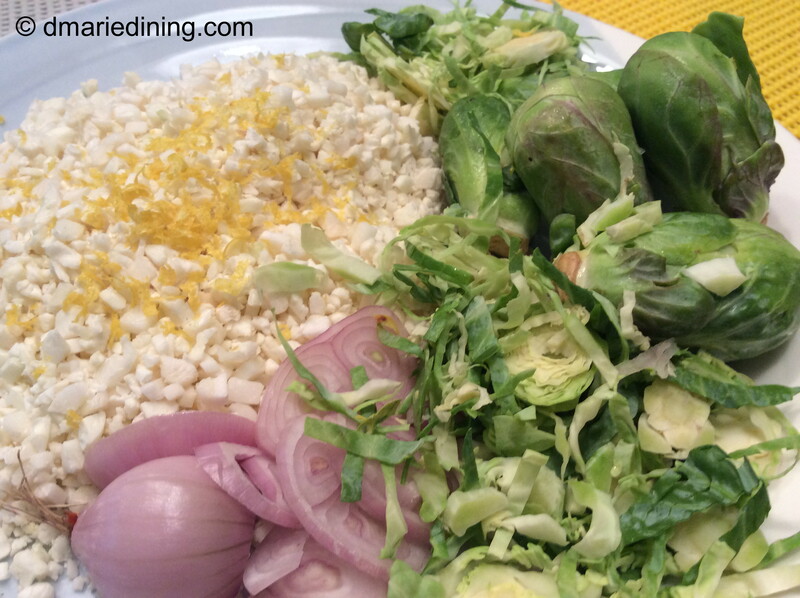 The next time you are searching for a new cauliflower recipe take a chance on making Riced Cauliflower and Brussel Sprouts. I think you will be pleasantly surprised at how delicious it tastes. Place bacon in a large non stick skillet over medium high heat. Brown bacon until crisp then drain on paper towels. Set aside. Drain off all but 1 tbsp of bacon fat. Reduce heat to medium then add shallots and brussel sprouts. Cook until slightly softened. Add riced cauliflower and stir to mix. Sprinkle with bacon (reserve enough bacon to garnish dish). 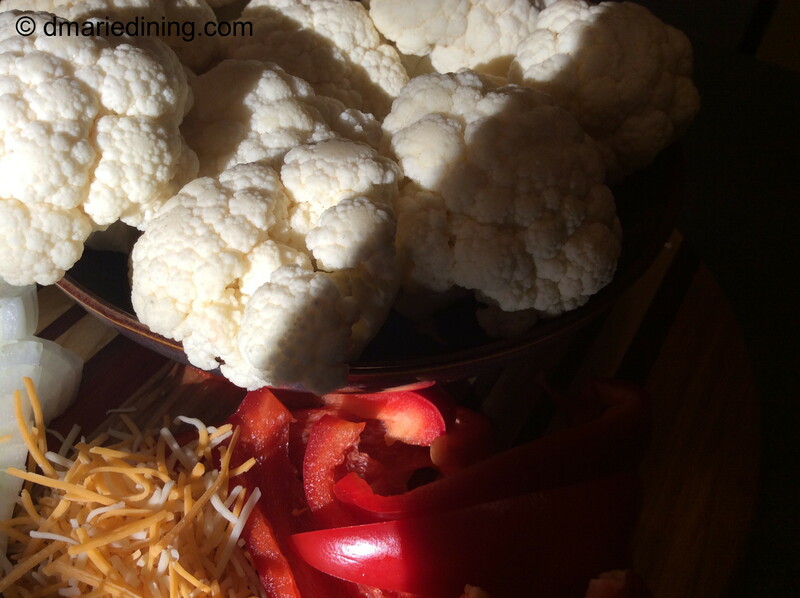 Cook cauliflower until tender but slightly al dente. Top with reserved bacon. Lately, I have been eating a lot of cauliflower which means I have to come up with different ways to fix it so that we don’t get bored with cauliflower. 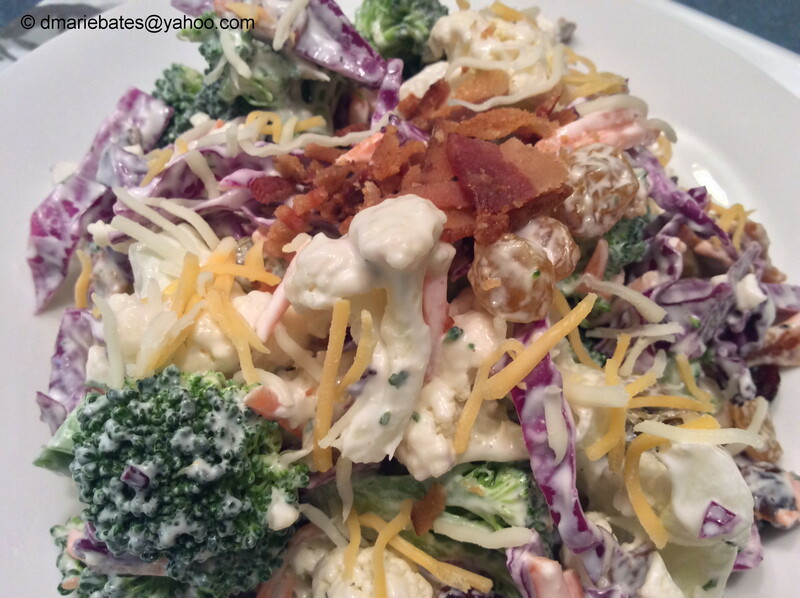 I really like broccoli salad so I thought I would add cauliflower and a few other ingredients to my standard recipe to create a new fresh salad. The spring and summer seasons call for light flavorful dishes. Cauliflower is big, pretty and plentiful during this time of year. As the seasons progress, cauliflower becomes less expensive so it usually ends up in my shopping cart. 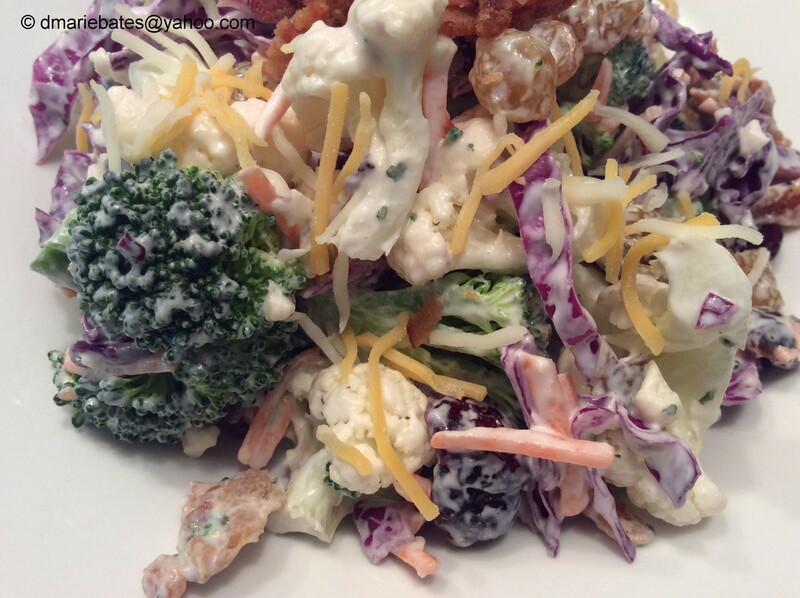 My biggest surprise after making my Broccoli and Cauliflower Salad was that my youngest son really liked it. He can be picky when it comes to eating raw vegetables so I was taken aback when he dipped his fork into the bowl and scooped out some of the salad. His reaction surprised me even more and I suddenly realized I may not have any Broccoli and Cauliflower Salad left to take to work for lunch. No worries. I would rather see T enjoy eating raw veggies than worry about lunch the next day. Besides, I quickly put aside a little salad in a container then put it way back in the frig before hubby and T could polish it off. This is one recipe I am sure I will be making all summer long. Bring on the BBQ!!! I have a dish I think everyone will love. 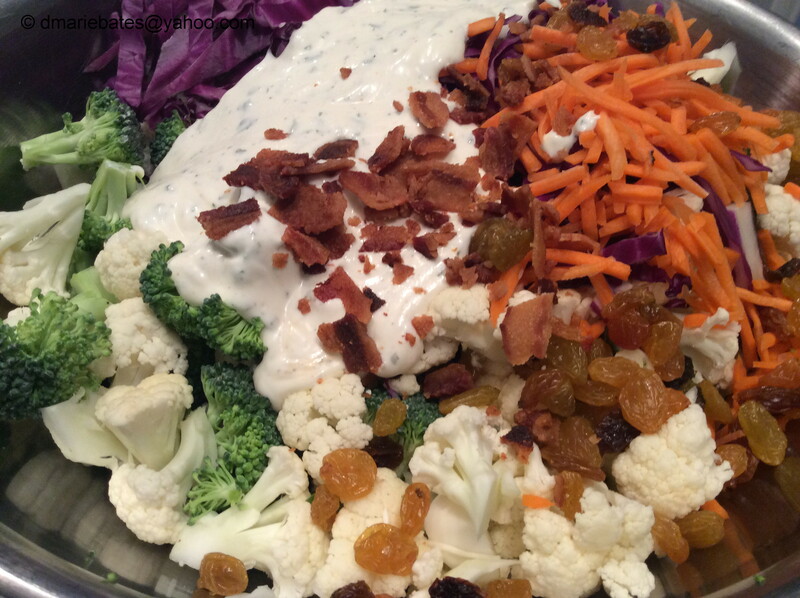 Combine broccoli, cauliflower and raisins in a large bowl. 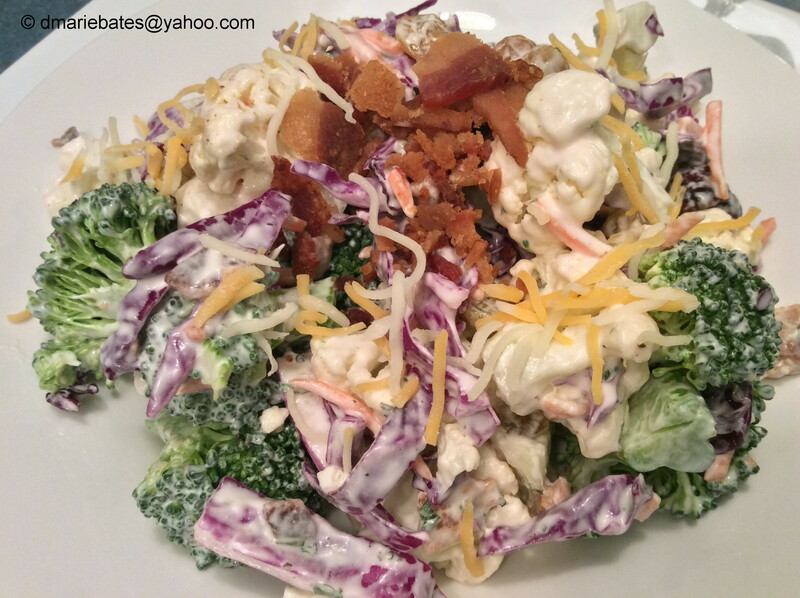 In a medium bowl blend together sour cream, mayo and seasonings. 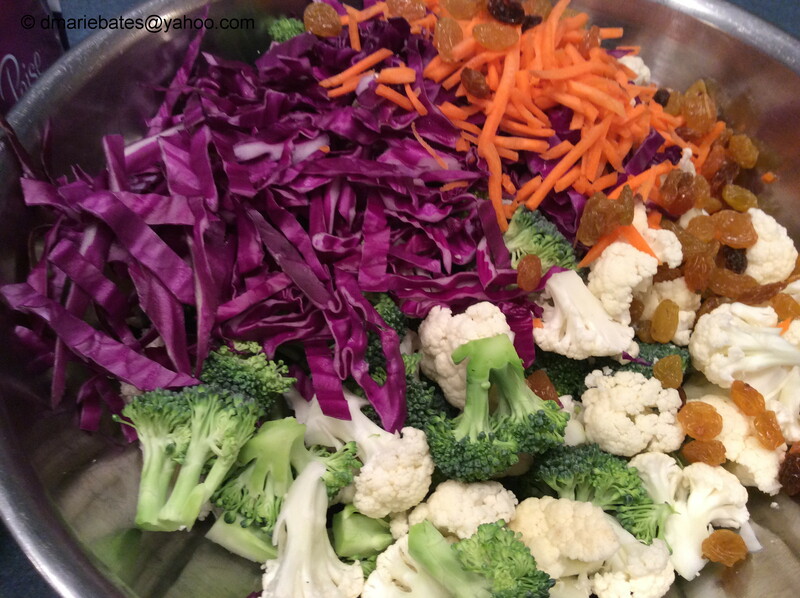 Pour over veggies and gently mix to coat. Sprinkle with bacon (reserve a little bacon for garnish) and cheese then gently toss. Chill 30 minutes. Serve chilled or at room temperature. 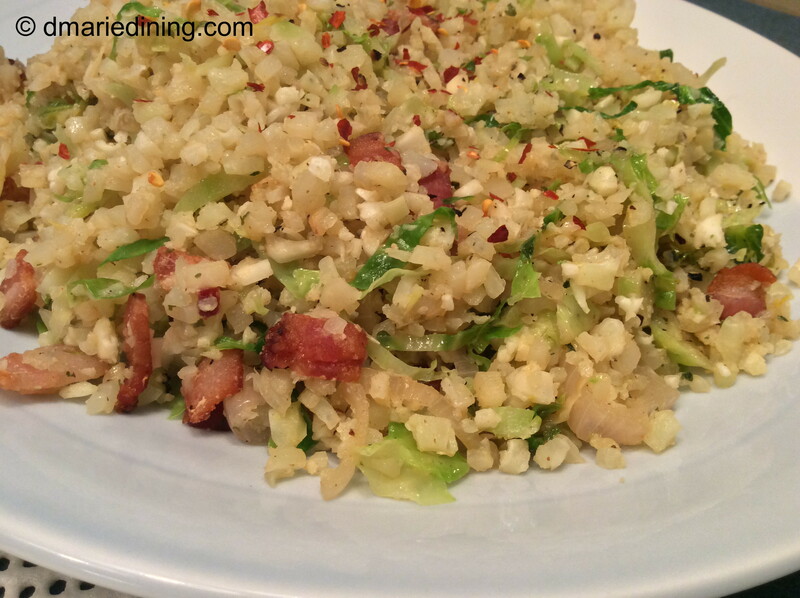 Top with bacon crumbs before serving.